Holding a 63-year-old woman guilty of contempt for repeatedly disobeying the orders of the court against raising construction over a disputed plot of land despite giving an undertaking and not even bothering to tender an apology, the Supreme Court has sentenced her to three-month imprisonment besides a fine of Rs 20,000. A bench of Justice Madan B Lokur and Justice Deepak Gupta sentenced Deoki Devi to three months in jail following her contemptuous conduct in raising construction over a plot of land in Vrindavan under dispute despite its interim stay. The controversy arises out of consolidation proceedings and dispute dating way back to the year 1981. “We hold Deoki Devi guilty of civil contempt and sentence her to simple imprisonment for 3 months and to pay a fine of Rs. 2000 only,” the bench noted. It, however, added that the sentence of imprisonment imposed upon her shall be suspended on the condition that she complies with the direction given in a related appeal wherein the bench directed Deoki Devi to remove all construction and handover peaceful possession of land to appellant Mahant Lalita Saharanji. “Compliance with the orders passed in the Civil Appeal will absolve her from undergoing sentence of imprisonment. In case she fails to comply with the directions…then she will have to undergo the sentence of imprisonment imposed,” said Justice Deepak Gupta speaking for the bench. The order of imprisonment comes on a contempt petition filed by Mahant Lalita Sharanji. It is to be noted that Mahant Lalita had filed a special leave petition in the year 2006 praying that Deoki Devi be restrained from raising any construction over the land in dispute situated on Vrindavan Chatikara Agra Main Road and from changing the nature of the land in dispute. The apex court had then directed that status quo be maintained. It had extended its interim order in 2009. Despite the interim orders, Deoki Devi raised construction whereafter the petitioner filed a complaint the Officer In-charge of Police Station Vrindavan on October 2, 2010, followed by a contempt petition in the Supreme Court. While issuing a notice to Deoki Devi, the court once again directed that no construction of any nature – temporary or permanent, shall be raised on the said plot of land. After initially contesting the contempt proceedings, Deoki Devi admitted that in the year 2010, heavy rains had lashed the area of Mathura-Vrindavan and because there was an imminent danger to the building, she had carried out some repair works. His counsel informed the court on January 31, 2011, that the offending construction stands demolished and the structure is now not habitable. 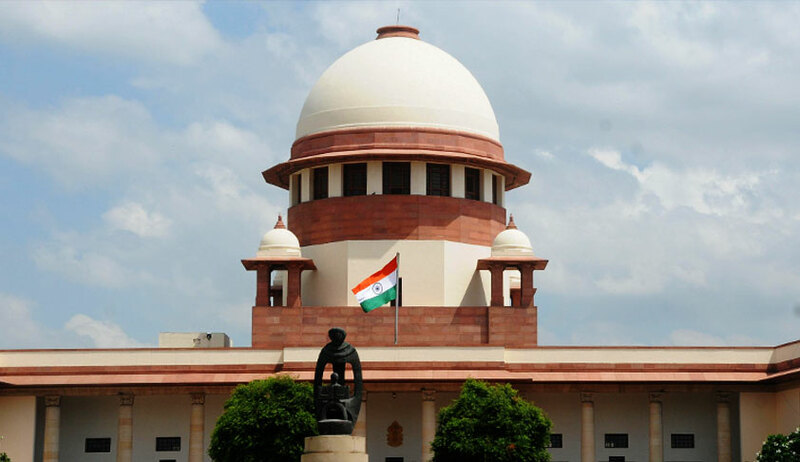 An undertaking was also given by Deoki Devi that she would not raise any construction on the said land and therefore, the contempt had been purged leading to the apex court disposing of the contempt petition. In 2017, a second contempt petition came to be filed alleging that Deoki Devi had again raised construction on the very same land and was residing therein. The court was presented with photographs showing a new house on the plot of land. Outside the new house was a signboard advertising that air-conditioned and non-air conditioned rooms were available on rent. This time around, Deoki Devi told the court that she had barely carried out some maintenance work since the dilapidated condition of the property was attracting anti-social elements and vagabonds and some bus operators had started parking their buses therein. She also claimed that the advertisement for letting out rooms was in respect of some other property in the vicinity where she and her family is residing. The court was, however, not convinced with her submissions. “The photographs filed depict a totally different picture. What has been constructed is a fairly large house and when we compare it with the photographs filed in the earlier contempt petition in the year 2011, it is apparent that the structure now built is totally different from the structure, which was demolished in the year 2011. “In case Deoki Devi felt that the property is going to waste, the proper course for her was to approach this court either for modification of the earlier order of injunction or to seek fresh order in order to protect the property. She could not have taken the law in her own hands and totally violated the interim order of injunction granted by this court. The photographs of the property clearly show that it was being put to commercial and residential use,” said the bench. Holding her conduct to be contemptuous, the court said, “It seems to us that since Deoki Devi got off very lightly in the earlier contempt proceedings, she feels that she can take the law into her own hands. The reply filed by her virtually aggravates the contempt. According to her, she had not raised any construction in violation of the orders of this Court. This statement is obviously false and even her learned counsel could not enlighten us as to how the construction, evident from the photographs, which are not even denied, does not violate the orders of this Court. Not only that, with regard to the signboard outside the property informing the general public that air-conditioned and non-air conditioned rooms are available for rent, the explanation given is totally false”. “We have, therefore, no hesitation in coming to the conclusion that Deoki Devi has wilfully and knowingly disobeyed the interim order of this Court. Not only that, she has also violated her solemn undertaking given to this Court and the order passed by this Court in the earlier contempt proceedings. Therefore, she is guilty of civil contempt,” it held. Deciding on the quantum of sentence, the court pointed out that Deoki Devi had not even tendered an apology. “All that she had said in her reply is that ‘... if indeed her actions have resulted in violation of this Hon’ble Court’s orders in any manner, she is willing to tender an unconditional apology...’ This is no apology in the eyes of law. There is no redeeming factor except the fact that she is a lady aged 63 years. She has not submitted any apology – qualified or unqualified. She has raised construction on the land in dispute in total violation of the orders of this Court,” the court noted. “As far as the quantum of punishment is concerned, Deoki Devi has obviously no respect for law of the land and she has wilfully disobeyed the orders passed by the highest court of the land. She obviously does not care for the rule of law. In such an eventuality, we are bound to impose punishment in such a manner that it upholds the majesty of law,” said the bench before handing down the sentence of three-month jail term and fine. It is to be noted that the appellant is the Mahant of Shri Mukunddevacharya Peeth, Topi Kunj, Temple of Thakur Radhemohanji Maharaj at Vrindavan. The temple was the owner of plot bearing No. 212/2 measuring 2.48 acres. Deoki Devi was owner of land bearing No. 319 measuring 0.44 acres. After consolidation proceedings, the Mahant was allotted a portion of Plot No. 212/2, a portion of Plot No. 215 and a portion of Plot No. 216. A portion of Plot No. 212/2, adjoining the road, was treated as ‘bachat land’ for use by the Gaon Sabha. One Premwati was also allotted a small portion of land in plot no 212/2. The land reserved as bachat land for use by the Gaon Sabha and the land allotted to Premwati adjoined the Vrindavan Chatikara main road. Deoki Devi was also allotted a portion of Plot No. 215 measuring 0.18 acres. The Mahant did not challenge allotment of land to Gaon Sabha. An appeal was filed by one Bansi Ballabh challenging the allotment of land to Deoki Devi. The Settlement Officer amended the allotment and Deoki was given share in plot 212/2 while the ‘bachat land’ was shifted to another plot. The share of Mahant was also amended. This came to be challenged by Mahant but the Allahabad High Court held that he had no right to challenge the same as he had not challenged the initial settlement when the front portion of land was treated as ‘bachat land’. The Supreme Court, however, set aside the high court order saying the later allotment of land to Deoki Devi and shifting of ‘bachat land’ gave rise to fresh cause of action to the Mahant.